All transactions are safe and secure with a reliable history in online purchasing behind each of our associates. Buy the Goonies Never Say Die t-shirt to own Goonies clothing and merchandise. Mikey Walsh (Sean Astin) yells the famous line in the movie, "Goonies never say die!" Now you can show your Goonie spirit with this Never Say Die Goonies t-shirt. The front of the tee displays a skull and anchor design with the Goonies movie quote on the anchor. The design shown above can be purchased on a variety of light and dark Ts. Wear it with Goonies hats. 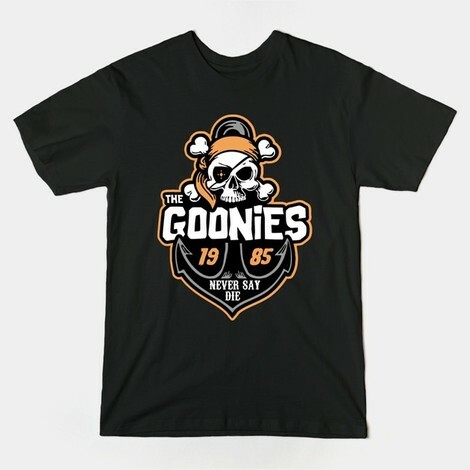 In addition to the Goonies Never Say Die tee above, browse the Goonies Clothing Gallery for more apparel like men's and women's clothes, kids shirts or hoodies.